Located in the Andes at an altitude of approximately 5,000 feet, Medellin enjoys an almost perfect climate year round with average temperatures of 72° F year round, which has earned it the nickname of “the city of eternal Spring”. Medellin, the second largest city in Colombia with a population of 2.5 million, is the capital of the Antioquia region and considered one of the driving forces of Colombia’s economy. Once known as one of the most dangerous cities on earth, Medellin has re-invented itself as a vibrant cultural hub with fantastic museums, cool cafes and trendy restaurants. Getting around is easy and inexpensive thanks to the city’s metro, bus and tram service. 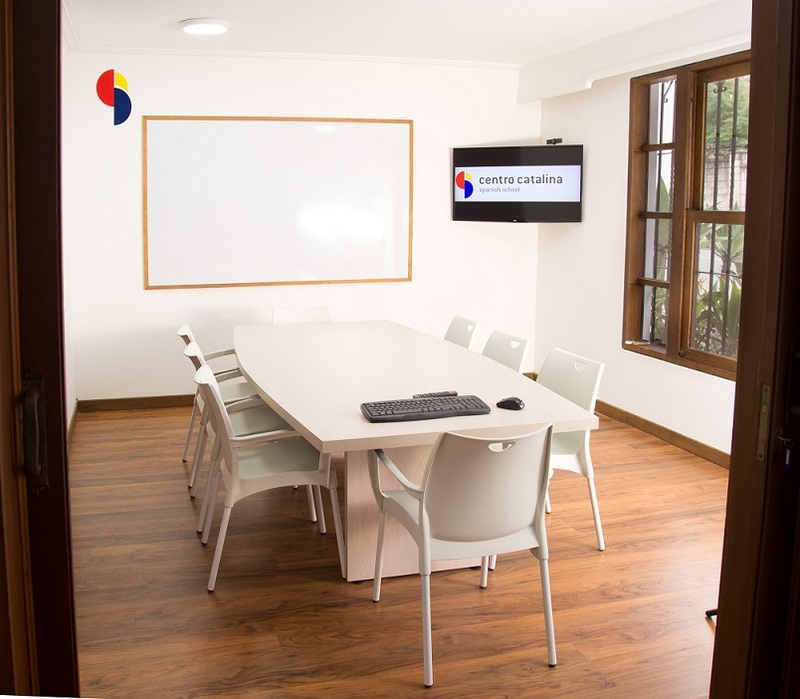 Centro Catalina, our new Spanish school in Medellin, is located in the renowned and very nice neighborhood of El Poblado, just 5 minutes walking distance from Parque Lleras and Poblado Park. It is located on a quiet street, surrounded by beautiful green areas and parks. Just two blocks away you will find Poblado Avenue, close to the best restaurants, hotels, bars and points of interest of the city. 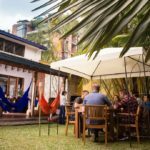 Centro Catalina Medellín occupies a beautiful 8000 ft2 house with 6 classrooms, a courtyard, an outdoor garden where students can relax, have barbecues, and have good time together. There is also a library and free Wi-Fi access. 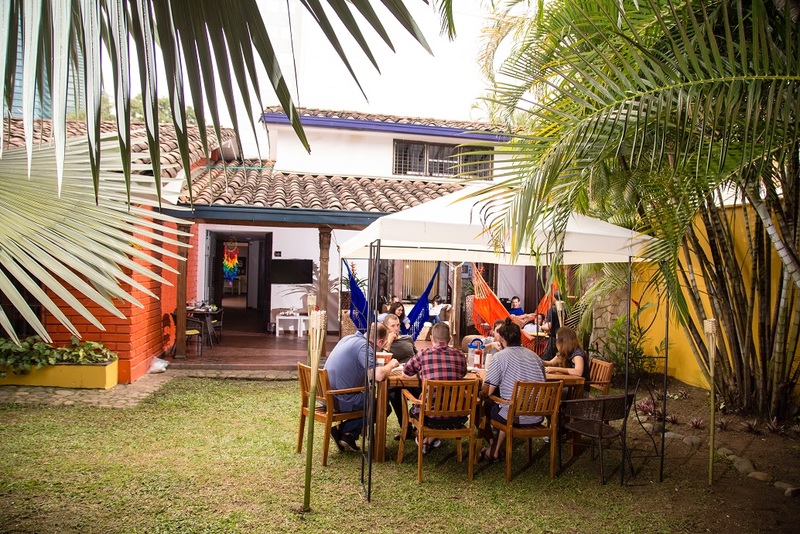 The back of the building houses a student residence, an excellent option to stay next to the school with fellow students in the best area of ​​the city. 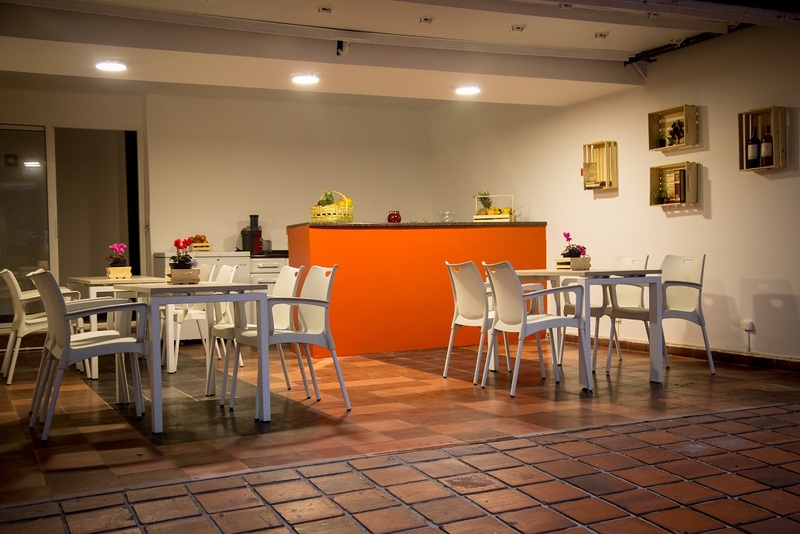 The cafeteria offers the best coffee of the region, tropical juices of all kinds of delicious snacks. 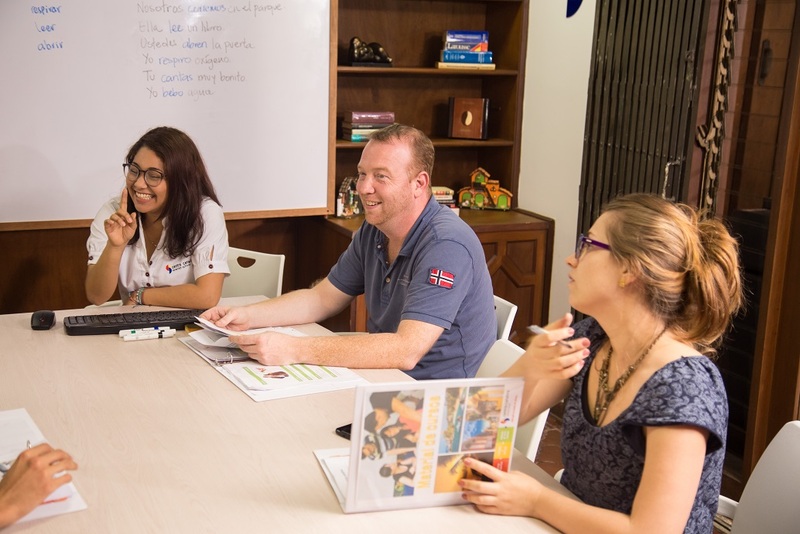 Centro Catalina’s Spanish teachers are all Colombian natives, very dynamic, motivated, and professional. 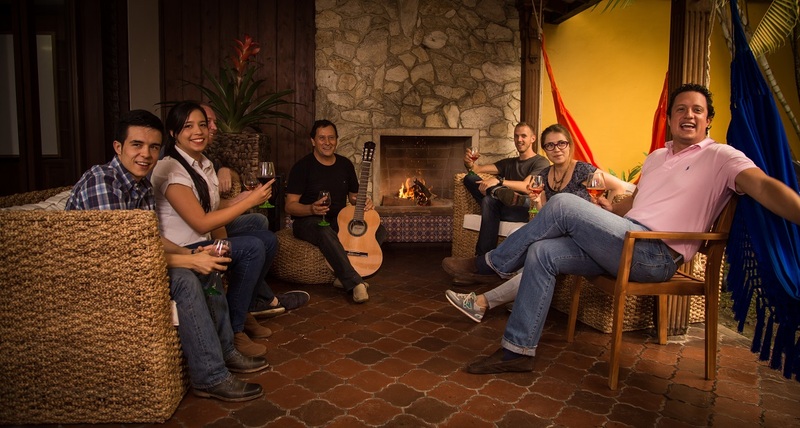 The Catalina team is well prepared to offer students a high-quality Spanish educational and cultural experience. All teachers are qualified university graduates, motivated, and experienced. We choose our Spanish teachers not only based on their qualifications but also for their personality. Teaching staff and administrators meet on a regular basis to optimize the school’s methodology and improve services. 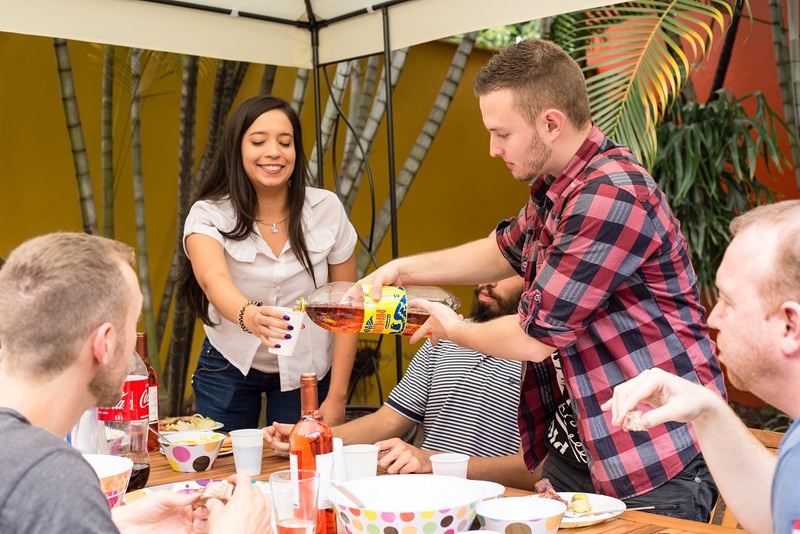 The Spanish courses are a dynamic, multicultural mix of students of all ages from all over the world including Australia, United States, Canada, Holland, Switzerland and Germany. Although the majority of our students are young adults, aged between 18- 35, we believe it’s never too late to start learning Spanish, and mature students are more than welcome to join us. Class sizes are small, with an average of 5-6 students per classroom (maximum 8), thus maximizing the learning potential of every 50-minute class. Each course is divided into six different levels, from beginners (A1) to advanced (C2). Students can also opt to take private afternoon classes, where the professor will provide a personalized program that focuses on their needs. Private classes also give students the opportunity to focus on specific issues such as business or medical Spanish. 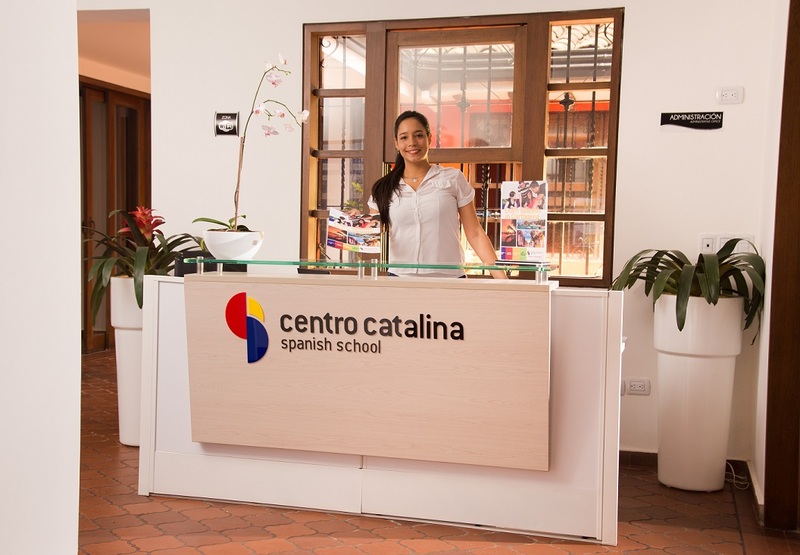 Centro Catalina also offers Spanish Courses in Cartagena, Colombia. Students may combine courses at both locations. Minimum enrollment age: 18. Prices include registration fee, number of lessons as listed below, language level testing on arrival, certificate of completion on departure, and three cultural activities per week. Each lesson is 50 minutes long. 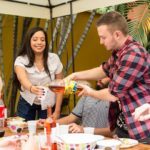 Standard Spanish Course: 20 Spanish Lessons per week. Maximum of 8 students per class (average 5-6). Course consists of 20 lessons per week (4 Spanish lessons per day from 9:00 AM to 12:40 PM, Monday through Friday). All levels from Beginner to Advanced. Intensive Spanish Course: 30 Spanish Lessons per week. Maximum of 8 students per class (average 5-6). 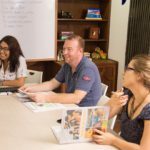 Course consists of 20 Spanish lessons per week (6 Spanish lessons per day from 9:00 AM to 12:40 PM and from 2:00 PM to 3:40 PM, Monday through Friday). All levels from Beginner to Advanced. Combination Spanish Course +5: 25 lessons per week. Combination of the Standard Spanish Course (20 group lessons per week) PLUS 5 private lessons per week. 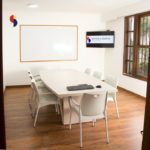 Course consists of 25 lessons per week: 4 Spanish lessons per day from 9:00 AM to 12:40 PM Monday through Friday, and one private lesson during the afternoon each day. All levels from Beginner to Advanced. Combination Spanish Course +10: 30 lessons per week. Combination of the Standard Spanish Course (20 group lessons per week) PLUS 10 private lessons per week. Course consists of 30 lessons per week: 4 Spanish lessons per day from 9:00 AM to 12:40 PM Monday through Friday, and two private lessons during the afternoon each day. All levels from Beginner to Advanced. 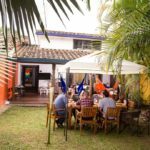 Private Spanish Courses: 10, 20 or 30 private Spanish lessons per week, One-to-one Spanish Language Training, all levels from Beginner to Advanced. With private lessons the content of the course as well as the tempo is personalized according to the student‘s needs and wishes. Therefore students are afforded the maximum amount of flexibility and individual support. Private Spanish courses start every Monday for all levels from Beginner to Advanced. 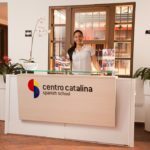 Starting Dates – Centro Catalina Medellin Spanish Courses: Courses for ALL levels start every Monday. Notes: When a holiday falls on a Monday, classes will start on Tuesday. Centro Catalina Medellin Holidays 2018: 1 January, 30 March, 1 May, 25 December. The school will be open during all other Colombian holidays. Classes lost due to public holidays are not made up. 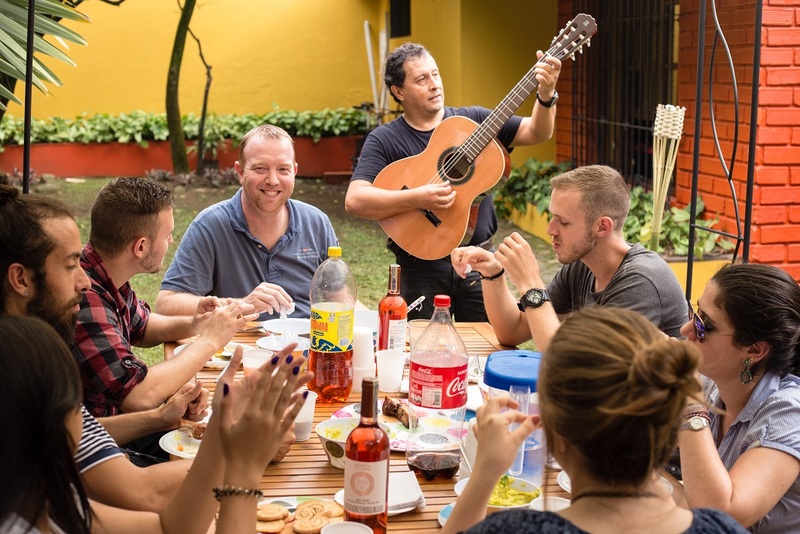 Centro Catalina Medellin Holidays 2019: 1 January, 19 April, 1 May, 25 December. The school will be open during all other Colombian holidays. Classes lost due to public holidays are not made up. 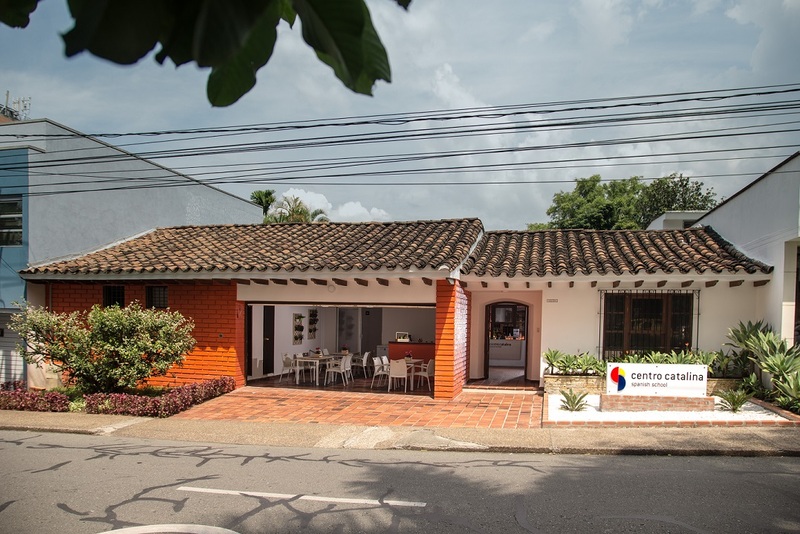 Centro Catalina Medellin offers accommodations in carefully selected local host families (single room or double room occupancy available for students traveling together), or at the on-site residence (see description below). Hotels and apartment rentals are also available upon request. 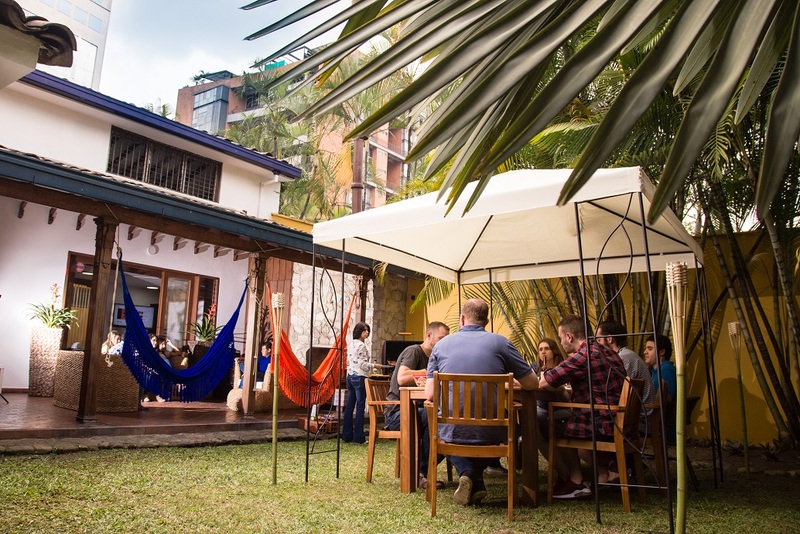 In addition to the host families, Centro Catalina in Medellin now offers an on-site student residence where students can enjoy the following amenities: large rooms, equipped kitchen available for cooking with your fellow students, a garden with BBQ, fireplace for cool nights, and free Wi-Fi. You will be a 5-minute walk from Parque Lleras, so when you decide to go out at night, it won’t be a problem to go back home. A delicious breakfast is included in the price. Standard rooms (single bed) and Superior rooms (double bed with private bathroom) are available. Prices listed for Host Family and Residence accommodations include Centro Catalina accommodation placement fee. Private baths in host families are available upon request at an additional cost of USD 30.00 per week. ** Hotel prices vary depending on size and location. Prices are given as an indication only and are subject to change. Please confirm price at time of enrollment. A USD 40.00 placement fee applies to hotel reservations made by the school. 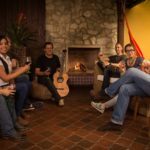 to help make your stay in Colombia an unforgettable experience. 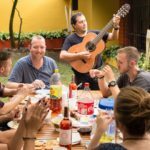 The social program varies from week to week, but here are just some examples of what you can look forward to when you study in Medellin: Salsa lessons, walking city tour, museum visits, cooking lessons, visits to the local markets, cultural exchanges, games, karaoke, city bike tour, and movie nights. 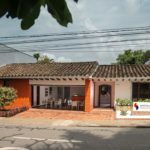 In addition, the school also organizes dance classes, volunteer work opportunities and excursions to towns and places of interest outside Medellin. The excursions are organized at least once a month. Please note that these classes and excursions are optional and offered at additional cost. 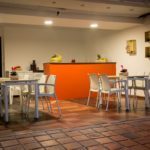 Centro Catalina staff will also help students plan their own social activities if they want to do something extra like going to a movie, listening to live music, hiking, etc. Airport Transfers: From/to Medellin airport are available upon request and at an additional charge of USD 45 each way.